and all others sink before him. and in attachment he equals the kindest of his race." Welcome to our home page! We hope you enjoy your visit. I'm Lisa Nicolello, native Floridian, animal lover, and avid gardener. 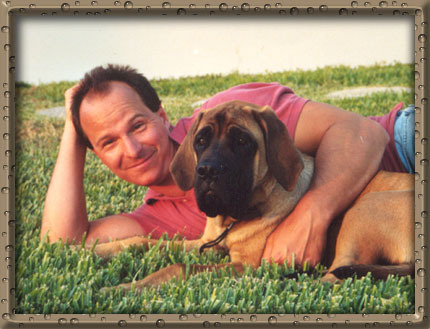 My husband Patrick (New York born and bred) and I enjoy our mastiffs as companions, guardians and true working dogs. We live in the country, in Jupiter, Florida. Our dogs are all beloved housepets, none are kennel dogs. We have our own bloodline that we started from Willowledge, Gulph Mills and English stock. We have a lot of fun with our dogs, as you will see on our other pages! We are dedicated to producing quality Mastiffs that enjoy soundness, health, longevity and have good temperaments. We have been testing/titling our dogs for over two decades. All of our breeding dogs are MCOA GOLD Health Award winners and have Canine Health Information Center (CHIC) Certificates, a fact no other breeder can claim. Please note, the mention of the MCOA Health Awards anywhere on this site, is not meant in any way to endorse, promote, imply or encourage membership in the MCOA. I am NOT a member of MCOA, nor do I want to be. I do not base my opinion of others on their membership in clubs but on what they actually do. I took part in the original Health Awards Committee discussions back in 1999. The awards were based on the Mastiff Reporter Star Awards designed by Sharon Krauss, Linda Monroe, Debora Jones and myself many years ago at a time when the MCOA did nothing to promote or reward health screening. 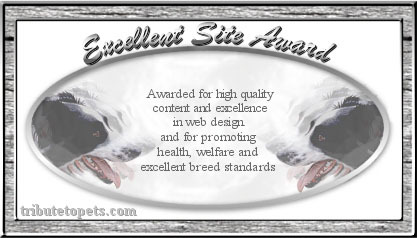 Both the Star Awards and the MCOA Health Awards were designed for ALL Mastiffs. I sent in the data on my dogs to support the efforts of the Health Award committee. I was thrilled that the MCOA, the AKC parent club for the Mastiff, was recognizing the importance of health screening for ALL Mastiffs. Unfortunately, as of May 9th, 2003, the MCOA decided to restrict Health Awards to dogs owned by MCOA Members only. Eventually, all of the MCOA Health Awards my dogs have earned will expire due to the fact that the club will not allow renewals or new awards, even when the original requirements are met. I will continue to fully test and certify my dogs. My dogs will be in the extensive OFA/CHIC database, so it will be easy to verify testing. Improving the overall health of the breed should be a priority of all breeders. Too bad that the National breed club does not feel the same. 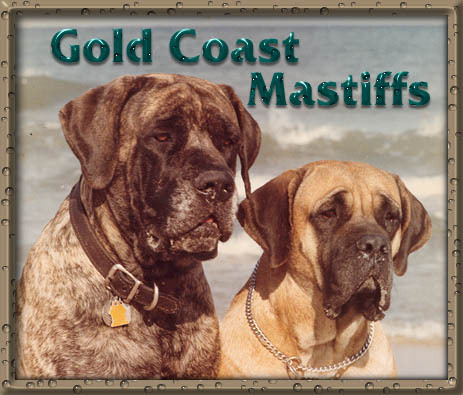 owned by Gold Coast Mastiffs. Link Central Search Engine - Get Linked!